The First Aid at Work training course is required by the HSE where a risk assessment has highlighted the need for the provision of First Aiders in the workplace. The First Aid at Work – FAW course meets the requirements of the Health & Safety at Work Act 1974. This First Aid At Work training course provides employees or individuals with the necessary skills and confidence to deal promptly and effectively with First Aid emergencies. When deciding which course is suitable, please use the assessment pdf. This may help in identifying the correct course. We are of course happy to help should you need further assistance as considering what is high and low risk may be unclear. This course is suitable for those businesses that require designated First Aiders in the workplace. This training can be run over 3 consecutive days or split over a longer period to suit your requirements. It has to contain 18 hours contact teaching time. This course is provided for a group of up to 12 at your own venue and costs from £799. 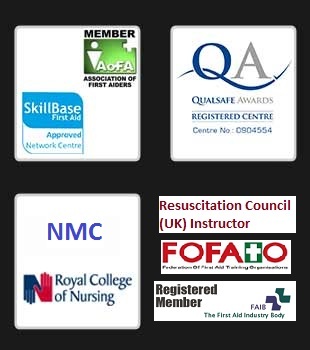 On successful completion of the First Aid At Work training course and final assessment, candidates will receive the HSE Approved, nationally recognised, First Aid at Work – FAW Certificate valid for three years.